Now finding a parcel waiting for you at the front door is pretty awesome. Opening the box and discovering what is inside is really awesome. 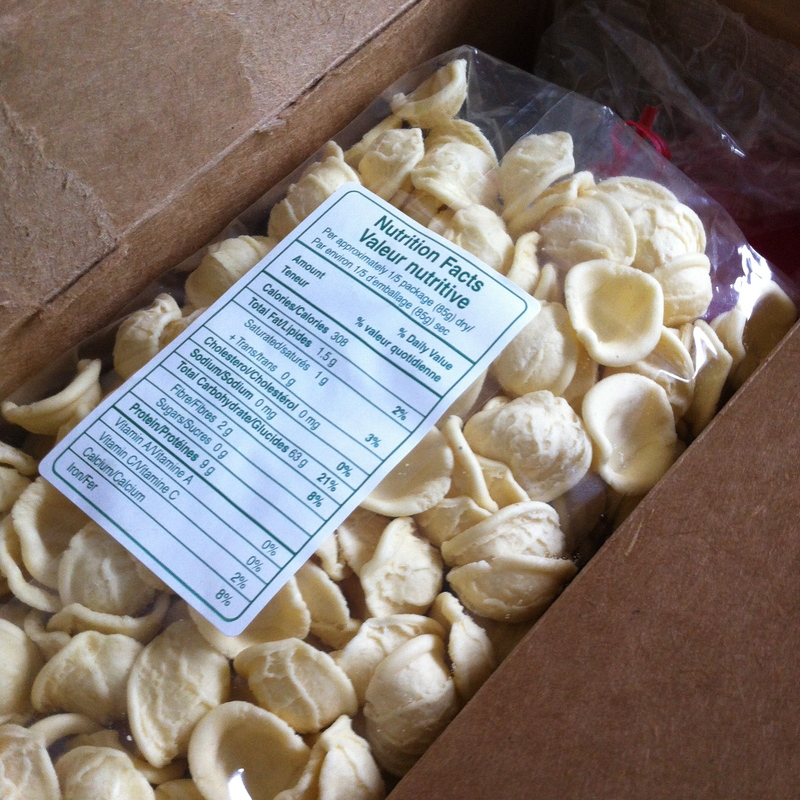 When I opened my parcel from Mo the first thing I saw was some fantastic looking Italian orecchiette pasta. Perfect little ears just waiting to hold some sauce. Yum. The gift just got more wonderful after that. There was delicious basil pesto, made even more fabulous by the fact that for some reason we have already consumed all of the pesto I made from last summer. There were some great Italian spices to add to, well, everything. Some polenta that I’m sure my husband will appropriate as he is the real polenta maker in the family. And even some Italian breadsticks to munch on while we are cooking! Perfetto. First register on line (see the button in the sidebar). On the 5th of every month, you will receive your penpal pairing via email. It’s your responsibility to contact your penpal and get their mailing address and any other information you might need (allergies, dietary restrictions etc.) You then have until the 15th of the month to put your box of goodies in the mail. On the last day of the month, if you are a blogger, tweeter or facebooker you post about the goodies you received from your penpal! The easiest thing is that the boxes can be filled with any sort of fun foodie, local food or homemade treats! The spending limit is $15. 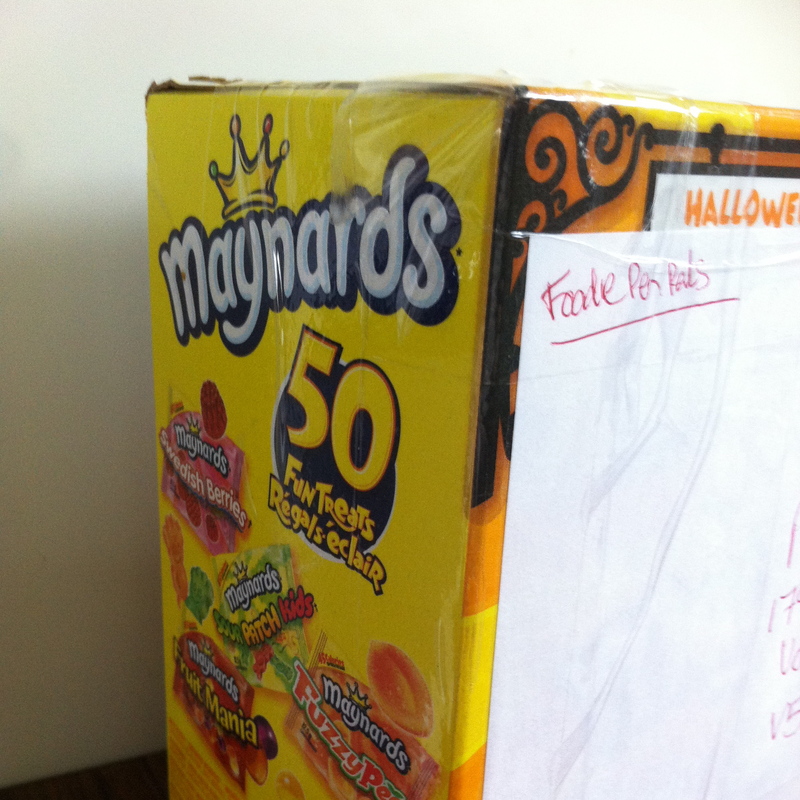 The box must also include something written (a note explaining what’s in the box, a fun recipe, a poem – use your imagination!). As an aside, for ease of mailing people are paired with people from the same country, so no worries about crazy mailing costs. For more details head to the lean green bean blog. 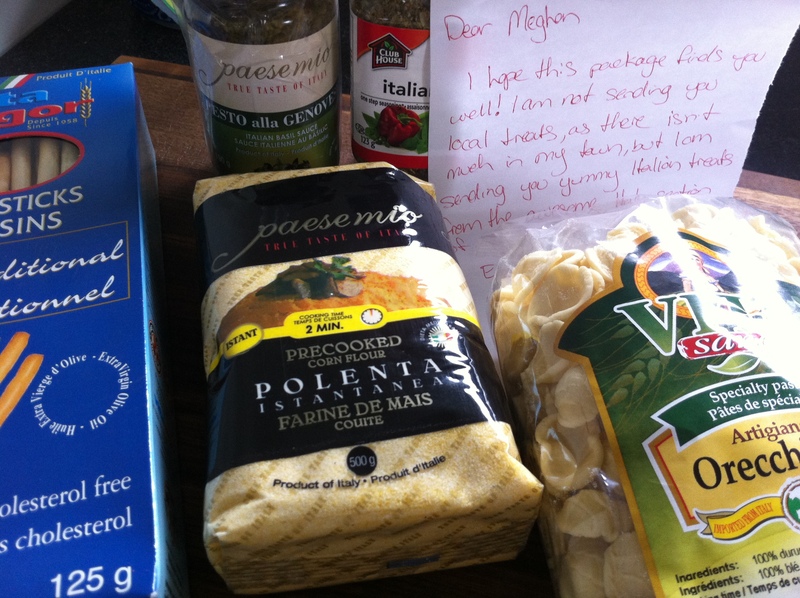 This entry was posted in Cooking, Food, Foodie Pen Pal, Friends, Mail and tagged basil, pasta, pesto, polenta, spices by mostlynoodles. Bookmark the permalink. Themed boxes are really fun and Italian food is the way to this girls heart for sure! Yay! Glad it made it to you in one piece, I was a little worried about the pesto breaking! I hope you enjoy all the goodies!